The call of Pope Benedict XVI for a robust rediscovery of the traditional Latin liturgy and consecrated life is at the heart of our foundation, a call that’s urgency and relevance at the service of the Church has in no way diminished under the reign of Pope Francis. We lead a life vowed before Almighty God, based in common prayer and totally immersed in the Catholic Church's traditional Latin worship and expression of the Faith. We assist our local diocese in their care of Catholics who are devoted to the old liturgy, and we help others to discover the great strength and beauty of the Church's ancient teaching and practices. Our mission of prayer seeks to bring back to the Faith lukewarm and fallen-away Catholics as well as to convert non-Catholics to the One True Faith. We support our local clergy with hospitality and a place of spiritual respite well-ordered by the Church's perennial liturgy and religious disciplines. Professed members of the Canons Regular of St. Thomas Aquinas pronounce vows coram Deo ('before God') of the three evangelical counsels: Poverty, Chastity and Obedience. These three traditional vows are the essence of religious life and represent the total consecration of the man to God. By the vow of Poverty, we freely renounce the personal acquisition of material wealth, sacrificing our ownership of property and other external things to God. By the vow of Chastity, we freely embrace continent celibacy, as Christ did, in witness of the Kingdom to come, thus consecrating our physical bodies to God. By the vow of Obedience, we freely imitate Jesus Christ who for our sake was obedient to His Father unto death even the death of the Cross, thus sacrificing our very will and spirit to God. Through these three vows, a man offers his whole life to God as one continuous act of religion. The Rule of Saint Augustine was written by St. Augustine of Hippo c. AD 400. It is the oldest monastic rule in the western Catholic Church, predating the famous Rule of St. Benedict by over a century. The Mahometan invasion of North Africa in the seventh century wiped out the original communities that had followed this Rule, but it was later revived in the eleventh century on mainland Europe. St. Augustine had found the inspiration for his Rule in the description of the original Christian community at Jerusalem in the Acts of the Apostles. Its central theme is cor unum, being of 'one heart' in God. "Unless the Lord build the house, they labor in vain that build it" (Ps 126:1). The Church relies on dedicated contemplatives to support her salvific mission to the world. For this reason, it has been said that contemplatives are at the very 'heart' of the Church. The Canons Regular of St. Thomas Aquinas embrace a vocation centered on God's worship and understand that whatever labors or ministry we do must needs follow from that same prayer. Prayer is the starting point; without it, our labors will not bear lasting fruits. Contemplative prayer and witness is a sign of contradiction and a remedy to a faithless world, which finds value only in what is seen and touched. 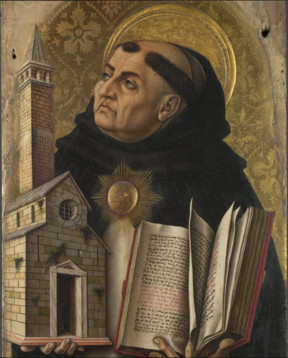 Our Patron, St. Thomas Aquinas, was a 13th-century saint, scholar, and poet. His clear and exact theology has been the bedrock of Catholic teaching in the Latin Church for nearly a thousand years. He is referred to as the ‘Angelic’ Doctor because of his devotion to the holy angels and the thought he contributed to our understanding of them, but also because of his angelic purity and personal holiness. He is called the Doctor Communis, or ‘General Doctor’ of the Church because his method of teaching the faith touched upon all aspects of it with great precision and truth. It is through his teachings on the Eucharist that the Church has chosen to express her dogma on the Real Presence of Christ in the Blessed Sacrament, which is central to our Faith. Through the centuries, St. Thomas’ work has proven a remedy in times of great doctrinal confusion. The Canons Regular of St. Thomas Aquinas are a non-juridical Catholic private association of men aspiring to establish a monastery sui juris following the Rule of St. Augustine in the tradition of canons regular, and entirely devoted to the ancient Latin liturgy of the Roman rite. The community began in 2012 at the invitation of the Most Rev. Francis R. Reiss, at the time an auxiliary bishop and vicar general of the Archdiocese of Detroit (now retired). From 2013-2017, the brothers also enjoyed the personal endorsement and authorization of the Most Rev. Allen H. Vigneron, Archbishop of Detroit. The brothers now reside outside the jurisdiction of the Archdiocese and are presently seeking new episcopal sponsorship for the permanent establishment of their monastery. Upon the elevation of the community to a public association of the faithful, their religious vows coram Deo will become public religious vows.